First and foremost: Wear comfortable, well-broken-in shoes on your river trip. Do NOT buy a brand-new pair of fancy boots or sandals the week before your trip and expect to wear those on the river. In no time you’ll be left with blisters and unable to participate in all of the adventures of your river trip. Many of your hikes will be through water and your feet will be getting wet as you step on and off the boats. 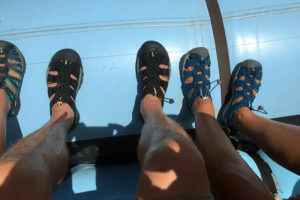 The best all-purpose shoes are river sandals or amphibious shoes. You’ll want something with a sturdy sole and grippy tread. This tread will keep you from slipping around on the boats and on your daily hikes. A heel strap is important so you don’t lose a shoe in a rapid. You might prefer a covered toe, to prevent stubbing your toes on rocks. Keen, Chaco, Teva, and Merrell all make excellent river shoes/sandals. The constant contact with water and sand can lead to blisters or sore spots on your feet. You’ll want to bring a couple of pairs of non-cotton socks to wear with your river shoes. Socks also offer great sun protection if necessary. If you are rafting with us on an oar trip, or have the tendency to run cold, you might consider packing a pair of neoprene booties/socks to wear under your river shoes/sandals. There may be a few side hikes where you’ll be glad to have an alternative to your river shoes. Make sure to pack comfortable athletic shoes or hiking boots. These don’t have to be anything fancy an old pair of sneakers is perfectly appropriate, as long as they still have some decent tread on them. These are a must-have item for those guests who are on one of our hiker’s special trips and hike in or hike out trips. An optional pair of lightweight flip flops are great to have while you’re in camp. If your river sandals are comfortable, those are great to wear in camp as well. We DO NOT recommend bringing thin, water-moccasin type shoes, also sometimes called water socks or water shoes. These shoes typically don’t have a substantial enough sole on them to keep your feet happy. They tend to be slippery and don’t offer enough support.